Gananda 7th grade students recently presented a check of $1,001 to Sebastian Maroundit, co-founder of non-profit organization Building Minds In South Sudan (BMISS). Maroundit fled his war-torn village of Mayen-Abun in Twic State, South Sudan when he was under the age of 10. He escaped to Ethiopia to find safety, and within four years found himself in the village with another war. He then traveled hundreds of miles to Kenya with thousands of other children in a quest to find safety. The trek lasted a year. The refugee camp in Kenya provided some schooling so at the age of 14, Maroundit entered first grade. In 2001, Maroundit was selected to resettle in the United States. Upon coming to the U.S. Maroundit was able to complete his education and received his Associate's Degree in Business from Monroe Community College. Later he furthered his studies at SUNY Brockport. In 2007 Maroundit returned to his home village in South Sudan to find what remained. The school had been destroyed so some of the children were meeting under a tree to learn. It was at this moment that Maroundit and his cousin Mathon Noi decided to focus their efforts on building a school for the children of South Sudan. Maroundit was a "Lost Boy" of South Sudan. Gananda 7th grade students recently completed a book, "A Long Walk to Water" by Linda Sue Park which depicts the journey of the lost boys of South Sudan. To finish out the unit, students were then introduced to a real lost boy, Maroundit, to learn about his journey and achievements in getting to where he is now. Students then also did a fundraiser of 1,000 steps to recognize the long journey the lost boys made. 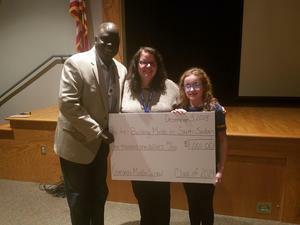 The funds raised were donated the BMISS which is just finishing the first all girls school in South Sudan. Additional information can be found at http://www.bmiss.org/.